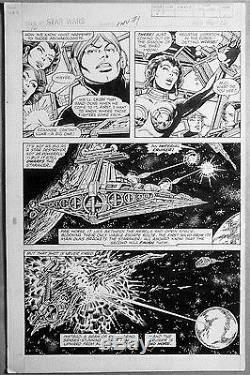 Here's a great interior page from Marvels Original Star Wars Series! This is page #12 and from "The World of Fire" story published in issues 107-109 of Star Wars Weekly in the UK. It's penciled by the incomparable Carmine Infantino with inks by (I believe) Gene Day. It's on standard 11x17 marvel stock and features Luke, Leia and and an exploding Star Destroyer! Feel free to ask me any questions and good luck! The item "Star Wars Weekly Marvel Original Comic Art Issue by Carmine Infantino" is in sale since Wednesday, September 14, 2016. This item is in the category "Collectibles\Comics\Original Comic Art\Interior Pages". The seller is "vermontjedi" and is located in Charlotte, Vermont. This item can be shipped worldwide.